Seven-year-old Venus Fox's unresponsiveness was so complete that Torey Hayden initially believed the child was deaf. Venus never spoke, never listened, never even acknowledged the presence of another human being in the room with her. Yet an accidental playground "bump" would release a rage frightening to behold, turning the little girl into a whirling dynamo of dangerous malice. Of the five children in Torey's classroom that September, Venus posed the greatest challenge-though the other four had serious problems of their own that could not be overlooked. The six-year-old twins, Shane and Zane, suffered from Fetal Alcohol Syndrome (FAS) and its accompanying mix of high agitation and low concentration. At nine, cocky, aggressive Billy had already been expelled from school twice. Eight-year-old Jesse suffered from Tourette's Syndrome. And then there was Venus. Though they all had different needs and afflictions, they each shared two things in common: a profound, sometimes violent dislike of one another, and the desire to be almost anywhere other than Torey's class. The school year that followed would prove to be one of the most trying, perplexing, and ultimately rewarding of her career, as Torey struggled to reach a silent child in obvious pain and need and, at the same time, create an atmosphere of learning and cooperation in a class bent on chaos. It would be a strenuous journey beset by seemingly insurmountable obstacles and darkened by truly terrible revelations-yet encouraged by sometimes small, sometimes dazzling breakthroughs-as an intrepid teacher remained committed to help a "hopeless" girl, and patiently and lovingly lead her toward the light of a new day. 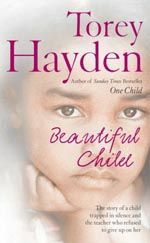 In this remarkably moving account, Torey Hayden once again displays the insight, intelligence, humor and, most importantly, the indomitable heart that have made her previous books not only phenomenal bestsellers worldwide but required reading for anyone personally touched by or interested in the treatment of emotionally disturbed children. Venus is currently working as a waitress. She is currently living with a partner and has an eighteen-month old daughter. She hopes to contribute to this page in the future. Jesse has graduated from business school and is now in a management position with a local company. He is married and has no children. Shane and Zane both continue to work in sheltered programs as far as Torey knows. She has not managed to contact them again. Billy has graduated from college and has a job in the defence industry. I'm the person who was Billy in BEAUTIFUL CHILD. Torey's cool. I can't believe I'm doing this. You want to know if things turned out okay? Yeah. I'm still a dickhead though. <g> I'm not married. I got a girlfriend. No kids. No dogs or anything. A 12-year-old BMW that might as well be a kid. I'm working for the bad guys right now (the government. )<g> I might be a used car salesman when I grow up, plenty of practice. Can't think of anything else. Hope everybody enjoyed reading this stuff. Have a good day.